Hi friends! 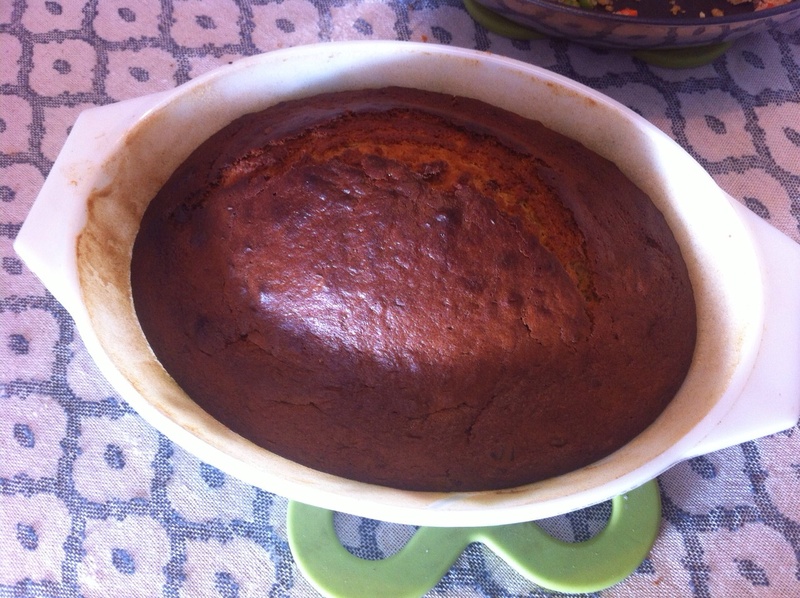 Here is a simple recipe of delicious Banana bread you will enjoy. Banana bread is a type of bread made from mashed bananas. It is often a moist, sweet, cake-like quick bread; however, there are some banana bread recipes that are traditional-style raised breads. Preheat the oven to 350°F (175°C), and Sift all purpose flour, salt, baking powder and baking soda together. Keep aside. Cream the sugar and butter in a large mixing bowl until light and fluffy. Add the eggs one at a time, beating well after each addition with wooden spatula, mix in vanilla extract. In another bowl, mash the bananas well with a fork . Add in the milk and cinnamon, mix well and keep aside. Add the banana mixture to the creamed sugar,butter mixture and stir until batter is smooth. Now add flour mix(from step-1) to it. Mixing until entire flour is absorbed in it. Now grease the baking dish with butter and dust it with flour. Pour the prepared mixture into the greased baking dish. Bake the banana bread in moderately hot oven (approx. 1 hour) till a tester inserted into the center comes out clean. Take out and cool the banana bread for twenty minutes. Remove it from the baking dish on the wire rack to cool it completely. Serve the slices with ice cream. Note:Slicing with a bread knife helps to make smooth slices, that aren’t crumbly. Bananas are a great pick-me-up snack because they provide carbohydrate in the form of quick-releasing sugars which your body can use for energy. Bananas are one of the richest sources of potassium in the world, with about 500 mg of potassium per banana. Potassium is another nutrient that is crucial for those who are physically active, but also for everyone else too. Potassium acts as an electrolyte and promotes circulatory health, helps to manage blow flow and hydration levels within the body, and helps oxygen to reach your cells. Potassium is useful in preventing high blood pressure and decreases the risks for heart disease and strokes because it regulates circulation, sodium, and water retention within the body . Potassium helps to lower high blood pressure because it counteracts the effect of sodium within the blood. Potassium also assists in the prevention of muscle cramping following exercise and helps you to heal and build muscle. This makes it an important nutrient for anyone who is especially physically active or who is recovering from an injury. Additionally, the high amount of potassium found in bananas has been correlated with helping to decrease symptoms associated with kidney stones, gout, ADHD, back pain, headaches, and more. Each banana contains about 3 grams of fiber, which is roughly 10% of the daily fiber you should be consuming. The fiber in bananas helps to prevent constipation, bloating, and other unwanted digestive symptoms.Dietary fiber also importantly helps you to feel full for longer. Another benefit of banana’s high fiber content? Studies have found that a diet high in dietary fiber is protective against heart disease, cardiac arrest, and stroke. Fiber helps to reduce inflammation as it removes waste and toxins from the body, keeping arteries clear from dangerous plague build-up Additionally, bananas are easy to digest and can help prevent cases of diarrhea. This is because of their starches and fiber which can help to bind waste within your digestive tract, while their potassium facilitates in balancing water retention in the gut and keeping you from becoming dehydrated.